On the homestead, there is food everywhere. Chicken coops, goat barns, rabbit pens, compost piles, in the gardens and in the home. Mice can carry disease, eat through food, including cardboard boxes, and even chew through electrical wires. Mice are not fun to have around, really. Laying traps or poison is what a lot of us do to get rid of the rodents. But, wouldn’t it be easier if you could get a barn cat to hunt mice? They would be able to decrease or eliminate the mice population and get fed at the same time. However, some cats are “broken” and won’t hunt mice. So, what does it take to get your barn cat to hunt mice? Is it possible to adopt a shelter cat and turn it into a barn cat that will hunt mice? Placing it in an enclosed, sheltered area for approximately a week. This would be a cage or kennel large enough for the cat to have it’s food and water dishes AND a litter box in a separate area. Spending time with the cat, while it’s getting to know it’s new surroundings. They need to get to know you and hear your voice. Over time, they will learn to trust you. Allowing it to go free after a week or so, and expecting it to hunt. Many cats will do this by nature, and females are often more well known for this than males are. The cat will then hunt, keeping the mice and other rodent population down. Does this work? In many cases, yes. Keep in mind, some cats will offer you the “present” of a kill, or you may not see signs of them hunting at all. If your mice problem seems to diminish, your barn cat is doing it’s job. 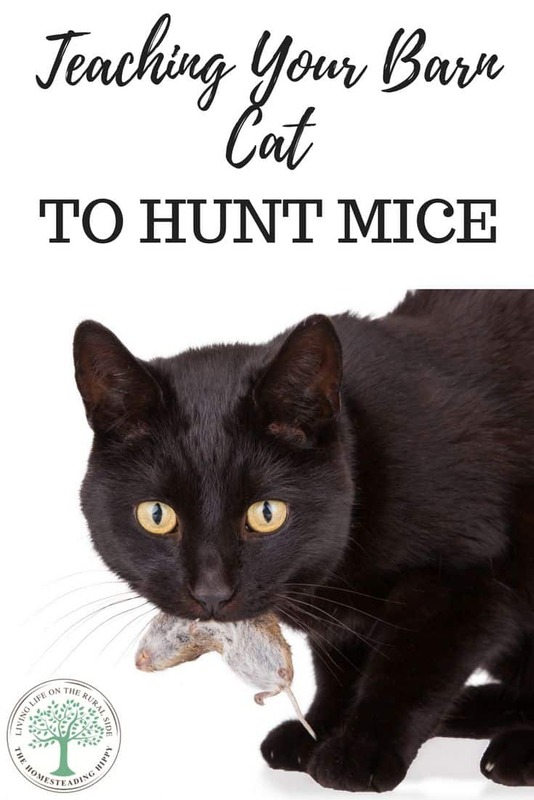 Can’t get your cat to hunt mice? Here are some other natural alternatives to poison. Let’s talk about some different breeds of barn cat. Some breeds are too “mellow” and won’t hunt. This includes the laid back breeds of Manx, Persion, and Ragdoll cats. Some have better reputations of being “mousers”, including the Shorthairs, Bengals, and Abyssian. However, breed alone doesn’t seem to determine whether or not the cat will hunt mice. However, when you are training a cat to hunt mice, you will want to remember that females are more known for hunting ability than males, and kittens will learn from their mothers how to hunt. If possible, you may want to consider allowing a female cat to have a litter of kittens to train to keep the mice population down on your homestead. For tips on keeping barn cats in winter, read the post here. Remember, though, that cats will need supplemental food and water from you, the human. Do NOT allow any animal on your homestead to simply have to provide it’s entire means of support. Provide fresh water at all times, and cat food at least once a day. This is how to keep barn cats around your homestead. If your mouse problem is outside or in a barn, consider adopting a feral or semi-feral cat from a shelter. These cats probably won’t become true “pets,” but will stay around when they have plenty of water, supplemental food, and a warm place to sleep. In a house, the mere presence of a cat can deter mice. 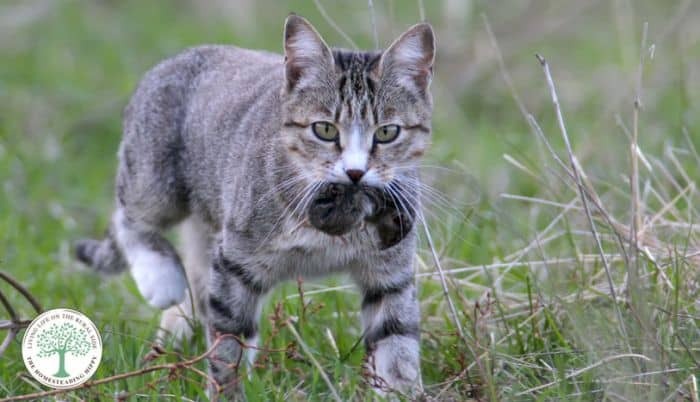 Your barn cat will learn how to hunt mice, and while they may not eat them, it WILL decrease the rodent population. What are some ways you have used to get your cats to hunt mice? Be sure to share in the comments! We had four cats, 1 male and 3 female. They were neutered and spayed so no kittens. Now none of our cats were feral or semi feral, they were true house cats. They loved to cuddle and be with us, and we them. Our children played with them as we did too, and when we moved they went with us we NEVER abandoned them or left them behind. That is something we could NEVER do as we knew that they relied on us completely. But at the second last house we were in, we had a huge fenced yard, oh one thing I forgot to mention was that we had 3 dogs as well. So the cats got along with our dogs and even played with them. We had a very loving and happy home where the animals were never ignored. But as I was saying when we moved into the second to last house it had a huge yard and a partial concrete fence. So with the dogs in the yard my kids and my husband starting letting the cats out for a couple hours each day, which I was VERY MUCH AGAINST! But they all felt that they’d be happy having the sensations of the grass etc, which I didn’t agree with. Anyway to say the least it was 3 against 1 not including the cats. At the same time we began having mice issues, and our male cat started getting interested in checking them out. Once he caught his first mouse he brought it to me as a gift. But it wasn’t dead so when he brought it and I was like a little freaked out even though I wasn’t totally, he killed it and layed it at my feet, which really did freak me out. Then they all started hunting down the mice and killing them. Sadly, it didn’t stop there, they began hunting the songbirds which was then a real problem for me. The mice were long gone and I think that now they had the instincts to hunt they wanted to do more and there was no prey except the birds. We landed up bringing them back into the house and not letting them out, but it didn’t work they’d sit at the door and cry loudly, telling us how much they hated being kept in. Then we moved again and once again had mice problems which the cats happily took care of. And we were back to square one, although this time when the mice were gone we didn’t have so much trouble keeping the cats in, and I think it’s because when we first let them out at the new place, they only were allowed out for around 2 hours, then in. Now they’re gone over the rainbow bridge and we miss them terribly. Sadly I had an allergy to them but when we first got them I was on desensitizing shots because I worked with a vet and they had an in house cat. So I had to have the shots to work, then when I left I still had the residual effects of the shots so I never had a problem, however, the cats are gone, so is my ability to not get sick. We tried to get a kitten again and I got deathly ill from the allergy. So the dr. won’t give me the desensitizing shots anymore because it’s gotten so bad. So as much as we’d love to get another cat I can’t have another. I’m sorry kitties and shelters we can’t help you. I wish we could. I have to disagree with your professor. I have always had cats and they have always hunted. We live in a farming area and their are mice EVERYWHERE. I volunteer for the local shelter and my main job is to take in orphan kittens for about 8 months out of the year. They come as young as 1 day old to 4 weeks old so some have never even seen their mother. I bottle feed them and raise them up until they are old enough to get ‘fixed’ and give them back to the shelter to find homes for them. I’ve kept only 4 of the bottle fed babies for myself. I kept them in the house until they are big enough to be safe outside. All of them are excellent hunters! There are always several mice, and sometimes birds, on the porch every morning. These kitties are no different than all the cats I have had who had their mother to teach them to hunt. I’ve heard some people try to force their cats to hunt by not feeding them. I think that is horrible and cruel! I keep dry food out for them all the time along with giving them a little bit of canned food each day, and they still hunt just fine. The only problem with a bottle fed cat is that they are such a loving and personable cat that they are always wanting to be petted and loved! I also have 3 dogs, 2 shitzu/poodle mixes and a chocolate lab. They love to hunt mice too! It’s like their favorite pastime. I put a sting around a mouse I got from a pet store, then treaded it like a cat toy. they loved it. then one cat bit into the mouse. and that was the end of a house cat and a extream hunter was born. even eat a whole red tail hawk once. lol this is what I do with all my kittens. it seams to work really well. oh, that’s a great idea, too! !